• Borders: Staten Island (west), Bronx and Manhattan (north), Queens (east). • Inhabitants: Around 2.5 million. • Top Attraction: Brooklyn Bridge, Prospect Park, and Coney island. • Shopping tips: Art and gourmet food. • Famous for: Many movies have been filmed here. • Nearest subways: Atlantic Avenue at Barclays Center, Broadway Junction, Fulton Street, South Brooklyn, DeKalb Avenue and Jay Street. Brooklyn is home to more than 2.5 million people, which means that if Brooklyn had city status, it would be ranked as the United States’ fourth largest city. Brooklyn’s top attractions are the iconic bridge that carries its name, Prospect Park, Coney island, and the scenic Brooklyn Heights promenade. Prices can be quite reasonable. Tickets for a theatre play can be had for $15 (£9). A three-course meal costs an average of $30 (£18). Accommodation is costly, although booking in advance can lower the prices significantly. British visitors to Brooklyn must remember that the prices displayed in the shops are not inclusive of tax, which in the state of New York ranges between 4 and 13 per cent, depending on the type of goods purchased. Having said that, Brooklyn is still a great shopping destination. The most popular items include the ubiquitous Brooklyn bridge souvenirs, coffee table photography books telling the story of the borough, and unique art pieces from the numerous art galleries in the area. Speciality shops like The Brooklyn Kitchen (for excellent gourmet finds) and Juice Box Wines & Spirits are highly recommended. The subway is the most convenient way of getting to and from Brooklyn. The neighbourhood is served by as many as 18 subway lines. The most transited subway stops are Atlantic Avenue, Fulton Street, South Brooklyn, and Lafayette Avenue. Virtually every destination in Queens, Manhattan, and the Bronx can be reached from Brooklyn using the extensive subway system. Throughout the decades, Brooklyn has retained its unique character and personality. Enclosed by New York Bay and Jamaica Bay, Brooklyn provides easy access to beach areas, the most notorious of which is Brighton beach. To the west of Brighton beach is Coney island, with its palm trees and sandy shores. The urban landscape is dotted with mansions, tree-lined avenues, ethnic shops, and numerous eating and drinking venues. A great way of getting acquainted with Brooklyn is by taking one of the 4-hour guided tours that provide an excellent overview of the borough’s history and gastronomy. A perfect way to end your stay in Brooklyn is to sit at one of the musical performances held at the unique Bargemusic, which is strategically located under Brooklyn bridge, and which offers weekly events in the most outstanding setting. Brooklyn’s interesting mix of heritage, culture, and history has contributed to placing the neighbourhood at the very centre of popular culture. Nearly 100 films have been shot in the streets of Brooklyn, including the acclaimed Annie Hall, Goodfellas, Dog Day Afternoon, Requiem for a Dream, Sophie’s Choice, Saturday Night Fever, and 9 ½ Weeks. Brooklyn’s Chinatown restaurants are highly recommended, and they do not only serve Chinese, but also Vietnamese, Thai, and Malay cuisine. The area around Park Slope is teeming with classy restaurants serving the most varied fares: Mexican, Italian, Japanese, French, etc. You will never be far from a great restaurant in Brooklyn. 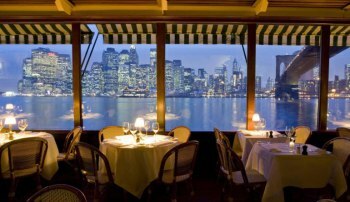 The following eateries come highly recommended by critics and toursits alike: Grimaldi’s (Italian), The River Cafe (international), Bozu (Japanese tapas), El Almacen (NY’s best Argentinian cuisine), Balaboosta (Middle Eastern), and DuMont (ideal for casual dining). Vegetarians will surely enjoy a meal at The Greens in Bklyn (on Brooklyn Heights), Bliss (in Williamsburg), Wild Ginger (near Atlantic Avenue), and Foodswings (five blocks north of Williamsburg bridge). Brooklyn is home to artists, commuters, a large Chinese community, and affluent families. Celebrities like Maggie Gyllenhaal, Jennifer Connolly, and Michelle Williams also live here. Visitors will be pleased to know that some of the world’s best cocktail bars are in Brooklyn. The nightlife here is thriving, full of exciting discoveries, and with options that cater to everyone’s tastes. Well off the beaten path is The Castello Plan, one of the oldest wine bars in New York. The Castello is only a couple of minutes away from Cortelyou Road station. Pok Pok boasts some of the best views of Manhattan’s skyline, and it serves innovative cocktails in a classy setting. If you go out in Williamsburg, make sure to visit The Post Office, a convivial haunt specialising in whiskey (although wine and cocktails are also served). Since they don’t have a website, it might be useful to write down the address: 188 Havemeyer St, Brooklyn, NY 11211. The most popular nightclubs are Montauk and the Knitting Factory. Be prepared to have your bags scanned at most museums and tourist attractions. Also, be warned about rush hour traffic (5-6am and 3-7pm) in case you need to get around by taxi. As a whole, Brooklyn is considered a safe neighbourhood for tourists and residents alike. However, and as in any other large city, visitors must exercise caution and common sense. The neighbourhoods of Red Hook, East New York, Crown Heights, and Canarsie are best avoided due to high levels of crime. 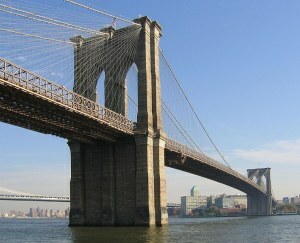 Brooklyn’s main tourist attractions are located in Williamsburg, downtown Brooklyn, Coney island, and Brighton Beach. These areas are safe throughout the day, although it is better to avoid flashing expensive mobile phones, cameras, or other valuable objects while sightseeing. Some travellers report that the 9th Street subway station is home to shady characters. Manhattan beach, located to the east of Brighton beach, is a refreshing space that not many visitors get to know. If you’re into beers you should visit Brooklyn’s brewery, offering daily tours around its 19th century facilities. And if you are into shopping, don’t miss Brooklyn’s flea market. What’s nearby? Visit some prominent areas in Manhattan, such as Little Italy and Nolita (North of Little Italy) while you’re in Brooklyn, since it’s only a short subway ride away.